I had never tried hand carving signs before, but I figured there's no time like the present to learn. I volunteered (again!) for the local community garden to make a sign for the trail going into the garden area. I had never done hand carved lettering before but I figured it couldn't be too bad. 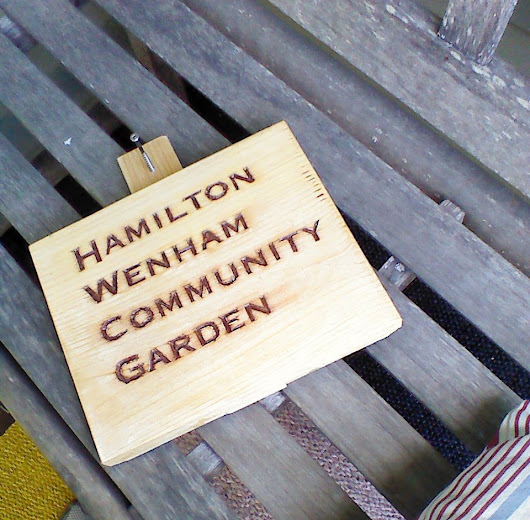 After starting the project, I soon wished the sign was shorter than "Hamilton Wenham Community Garden". That's a lot of letters to hand carve with just a chisel! I think it cam out okay for a first attempt. I learned a few tricks that I'll use on my next sign -- like making sure I cut deeply and cleanly when making cuts with the grain so it won't accidentally remove more wood than I was planning.